The secret to this apple-intense poke cake? Boiled Cider, a tangy reduction of fresh apple cider. 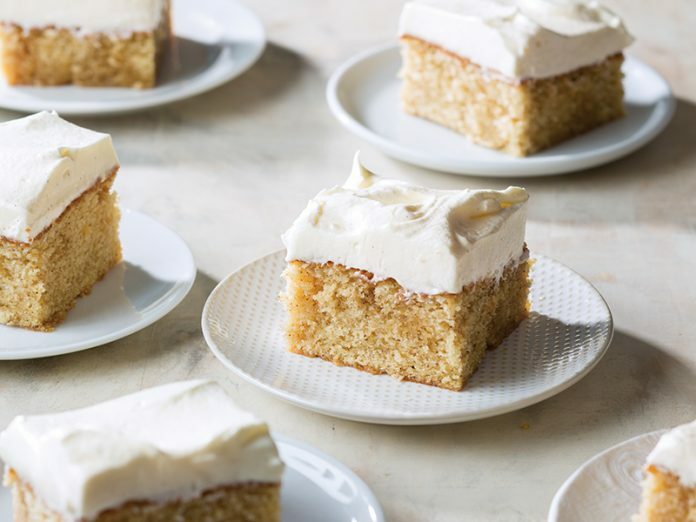 Take a bite of this tender cake, and you’ll find the best kind of surprise: pockets of tart boiled cider syrup hiding under a thick coat of cream cheese frosting. Don’t miss our guide on more ways to spice up your fall baking with boiled cider! In a medium saucepan, melt butter over medium heat. Cook until butter turns a medium-brown color and has a nutty aroma, about 10 minutes. Remove from heat, and place in a small bowl. Let cool in an ice bath, stirring every 5 minutes, until butter solidifies, about 20 minutes. Preheat oven to 325°F (170°C). Spray a 13x9-inch baking pan with cooking spray. Line pan with parchment paper, letting excess extend over sides of pan; spray pan again. In the bowl of a stand mixer fitted with the paddle attachment, beat browned butter and sugar at medium speed until fluffy, 3 to 4 minutes, stopping to scrape sides of bowl. Add eggs, one at a time, beating well after each addition. Beat in vanilla bean paste. In a medium bowl, whisk together flour, baking powder, salt, and baking soda. With mixer on low speed, gradually add flour mixture to butter mixture alternately with buttermilk, beginning and ending with flour mixture, beating just until combined after each addition. Pour batter into prepared pan, smoothing top with an offset spatula. Bake until a wooden pick inserted in center comes out clean, 35 to 40 minutes. Let cool completely in pan. Using a wooden skewer, poke holes all over cake. Pour cooled Boiled Cider over cake. Spread with Cream Cheese Icing. In the bowl of a stand mixer fitted with the paddle attachment, beat cream cheese at medium speed until smooth. Add butter, and beat until creamy, about 4 minutes. Beat in vanilla bean paste. Gradually add confectioners’ sugar, beating until smooth, about 2 minutes. Use immediately.